Great companies are built by smart people. The DMG team’s matrix of capital, networks and expertise is helping grow the startups our syndicate invests in. The DMG team actively meets and observes hundreds of entrepreneurs each year to identify the best investment opportunities. Syndicate Members review around 5 high quality startups (SEIS or EIS eligible) per year selected from our network. Focus. We keep it simple, keep learning and never stop asking ‘why’ and 'why not'? Execution. Excellence in execution is the key driver of success. Reciprocity. In the startup community we all give back and help each other out. DMG Syndicate Members are in the UK and overseas, share our values and want to contribute to, learn from and invest in the best startups. There is a modest up-front joining fee with no ongoing annual fees and no obligation to invest in any startup opportunity. Syndicate Members review information from each selected startup plus DMG’s short memo on the opportunity. DMG's memo gives our objective view of the strengths and weaknesses, and critically the factors that we believe would contribute to the startup's success. Syndicate Members share feedback and questions and we explore ways we together would add value post investment. Syndicate Members wishing to invest can participate with a minimum £10k. Post investment we work hard to add value with the network and expertise of our Syndicate, including taking board oversight. Our aim is to guide the startup towards growth and ultimately a successful exit. Upon exit, participating Syndicate Members get back their initial capital outlay first and 90% of gains thereafter. LiveSmart’s Founder and CEO Alex Heaton in their Runway East Office near Old Street. LiveSmart combines blood analysis, technology and health coaching to create a next generation health improvement platform. Why did DMG invest in LiveSmart? User demand for health data is on the rise and people want to know details of their own personal health profile in order to make lifestyle improvements and avoid chronic diseases. Employers are increasingly motivated to provide preventative health monitoring services to look after their employees and this B2B focus fits with what DMG and our Syndicate Members can help with. Since meeting Alex in 2016 we have been able to see the LiveSmart team deliver a great product, whilst growing and developing commercial partnerships with a range of corporates in the UK and abroad. We’ve also gone through the LiveSmart programme and can testify that it has helped us to improve our lifestyles too! Century's Founder and CEO Priya Lakhani OBE at TechCrunch Disrupt. Century is a platform for Artificial Intelligence, Machine Learning and advanced data science in education. The Century technology creates a personalised learning environment and improved engagement and outcomes for each student that uses it. Why did DMG invest in Century? Priya and her team's passion and drive to improve education using AI. Education and AI is a huge opportunity. Having 30+ students in a classroom being taught the same thing by one teacher is not the future. Students deserve a better learning environment and can get this with Century. Personalised learning for the students with reporting and analytics for teachers, head teachers, local authorities and even government. 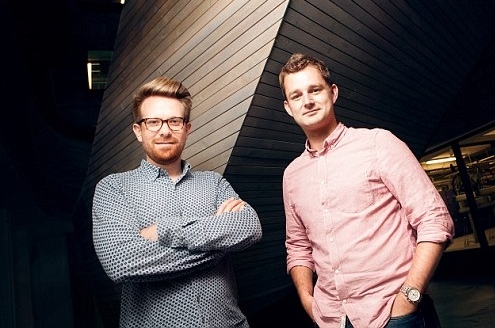 Coconut's Co-founders Sam O'Connor and Adam Goodall in a 'This is Money' feature. Coconut is a bank account for freelancers and the self employed. Coconut makes working as a freelancer easy by estimating tax and sorting expenses. Why did DMG invest in Coconut? Sam and Adam met at PwC and have started, grown and exited a startup together before. We first met Adam (via a DMG Syndicate Member) in 2015 and we were impressed by their focus and execution in raising investment and recruiting team members and users. There is an explosion of people working as freelancers and it's only getting bigger. Due to the changing nature of work many more people will have multiple 'income streams' that needs to be accounted for. The Nobly POS development team in the Montevideo office. Nobly POS is the #1 customer-rated EPOS system for hospitality and top choice for renowned coffee shops, delis, restaurants and chains throughout the UK, US, Canada and 20+ other countries. Why did DMG invest in Nobly POS? With a number of EPOS systems on the market knowing George and the team since 2015 allowed us to observe how they were executing in order to make a more informed decision. Over time we came to understand just how big the EPOS opportunity in hospitality is and the Nobly team's focus on executing well in this sector and not allowing themselves to be distracted has been very impressive. Observing important key decisions such as placing the development team in Uruguay and expanding to the US via Austin. FanBytes Co-founder and CEO Tim Armoo in The Evening Standard feature. FanBytes allows brands to advertise through Snapchat influencers at scale. The FanBytes tech enables brands to create, distribute and analyse Snapchat advertising. Why did DMG invest in FanBytes? Seeing Tim and Ambrose's dedication to the business since 2013 (Matthew was an investor in their very first round and helped incorporate the company). The team have achieved impressive revenue growth since then winning multiple large, repeat clients, securing further investment and growing an impressive team. Tim and Ambrose's impressive management of the business showed that they could run the company along side their university studies, gaining their degrees as planned. D&D Co-founders (and husband and wife team) Joel Jeffrey and Molly Goddard as featured in Startups. D&D make exclusive prints, designed in London and inspired by Joel and Molly's Sunday adventures. Made from top quality cottons these premium pyjamas are made to last. Why did DMG invest in D&D? Molly's infectious passion for making D&D into a world-beating brand and Joel's diligent focus on making quality PJs and solid business. The team's vision and focus has consistently enabled them to overcome growth pains impressively. We, like thousands of others, just love the product. Investor and trusted counsel to entrepreneurs since 2010. Matthew is a co-founder of 9others in 2011, an entrepreneur supper club now active in 45 cities worldwide with 4,000+ attendees. He is also an investor in Loot, FanBytes, Bearded Colonel and Hubbly Bubbly. Strong investor and entrepreneur relationships from Seed to Series A. MBA from Imperial College and BSc (Hons) in Software Engineering from Durham University. Away from DMG Matthew runs ultra marathons (like this), watches Formula 1 and enjoys spending time with his wife, daughter and son at home in Hertfordshire. Investor and advisor to startups since 2012. 20 years M&A and investing experience at Citigroup, Blackstone, Anglo American and now at a FTSE 100 TMT company. Previously Non Exec Director for a software company that IPO’d in London in 2016. MBA from INSEAD and BSc (Hons) in Maths with Economics from University College London. Aside from DMG Kash enjoys playing football every Sunday morning, supporting Tottenham Hotspur and spending time with his wife and two daughters at home in London. Advisor to HNW clients since 2004. William is a DMG Partner in Kuala Lumpur, Malaysia. As the founder and Chief Executive Officer of the Ingenious Haus Group, a boutique financial services company, providing corporate finance, private equity, wealth management & investment services to entrepreneurs, William connects Ingenious Haus' clients seeking high growth diligenced investment opportunities in the UK to DMG. William has an MBA and BA (Hons) in Accounting from the University of Hertfordshire. Thank you. Matthew or Kash will be in tough soon.